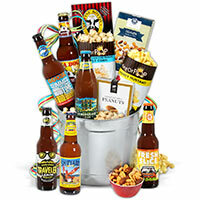 Check out our GourmetGiftBasket.com post here! ONE (1) entrant will be selected at random by the entry form to receive one Summer Seasonal Beer Bucket the sponsor reserves the right to substitute prize in the form of a gift card or similar priced item. Open to US Only adults only 21 and over is this does include alcohol. ID must be presented upon delivery and receipt of prize. In The Know With JoJo not responsible for prizing the sponsor is responsible for delivery of all prizes. My favorite is the Ultimate New England Brunch Gift Basket. Who doesn't love breakfast?! I like the Chocolate Premium Gift Basket! YUMMY!! I like their patriotic popcorn tin. My favorite is the Gourmet Meat and Cheese Sampler.